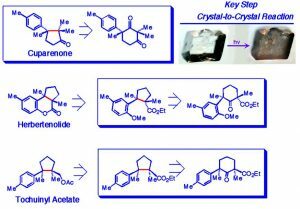 Our group is currently investigating the photochemical decarbonylation of crystalline ketones. Because the reactions take place in the solid state, they exhibit high selectivites that are not possible by the analogous solution reaction. From our experience, the solution photolysis yields many products, while there is often only one product in the solid. In order for the decarbonylation reaction to proceed in crystals, there are a few requirements for the decarbonylation precursor: (1) The compound must be a crystalline solid. (2) There must be suitable radical stabilizing substituents present at both alpha centers. Our methodology is currently being applied to the synthesis of several products. The promise in this method lies in the construction of adjacent chiral centers. In addition, the synthesis of adjacent quaternary centers is a synthetic challenge, and our method provides facile access to these types of compounds. Additionally, our method drastically reduces waste since no solvents are used and no chromatography is required since only one product is formed. Above are some of the natural products that our group has investigated. The key step in each of these reactions is the decarbonylative carbon-carbon bond formation. 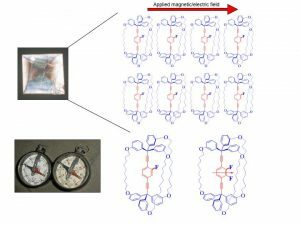 Our research into control of engineered motion in the solid state focuses on the design of molecules whose crystal structure supports and incorporates functional moving units that could exhibit useful collective effects and properties in the crystal such as dichroism and birefringence. Because they resemble macroscopic machines and machine parts in form and function we refer to them in those terms. For example, a gyroscope consists of a rotor that spins about an axis fixed to a supporting framework. In the same fashion, molecular gyroscopes possess a phenylene rotor that can reorient about its 1,4 axis, fixed to the framework supplied by the bulky end groups. Many other features of gyroscopes are also emulated in the structural programming of molecular gyroscopes. For example, in both cases, barrierless rotation is desirable and is approximated in two ways: the low intrinsic barrier of rotation (friction) and the encapsulation by the framework that, in the case of molecular gyroscopes, will be partly provided by adjacent molecules in the crystal. Although motional analyses involving solid state NMR and X-ray diffraction information have shown that much progress is being made in the design modification of monomers, covalent and self-assembled polymer-based strategies are also being developed to obtain higher degrees of processability and even faster rates of rotation.